Similar in some respects to the original mWarped Linear Prediction filter. The filter has 4 inputs and 4 outputs. In modes 1 & 2 ("code td" and "code fd"), it transmits side information on output channels 3&4. In modes 4 & 5 ("decode td" and "decode fd") it process input channels 3&4 to "reconstruct" channels 1&2. In mode 3 ("code+decode") only channels 1&2 are used and no side information is passed or processed. The plugin is not attempting to be a codec simulation and transparent coding/decoding is likely impossible. I'm not sure how far the plugin will be developed. Currently only a Mac VST (32-bit). Notes UI fix, primitive real time display of reflection coefficients at coder/decoder. Same basic idea as mWarped Linear Prediction Filter, but this time the filter can have a higher order, the residual signal after whitening can be shifted faster or slower, saturated or decimated. Furthermore, most parameters can be made targets of two LFOs and the envelope follower, in addition to which the output is fed back through a delay line and analyzed along with the input. There is no variable quantization of the residual in Anticode, though, because I didn't feel it really justified itself -- decimate is more interesting anyway. A noise source may be added at a later time, though. 2007.01.29 - The latest version will warn you that skin files are missing when you first load it. This is normal. Click 'Ok' to install the required files at the locations specified (or cancel if you decide not to use Anticode). If for some reason someone can't stand the imposition of having Anticode making a folder, feel free to complain (though I'm not sure what a good alternative is). In the meantime, if anyone would be so kind as to make a better skin for the plugin - please do! Feel free to ask for features that you feel are missing, though again I'm not sure I'll have time to help out. 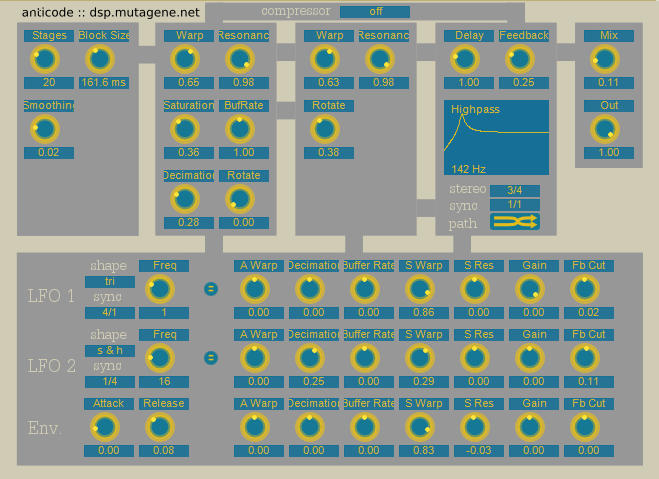 Array of 88 comb filters tuned using a .TUN microtuning file with feedback path. Is sensitive to MIDI input, with channels 1 and 3-16 activating their corresponding filters and channel 2 controlling the tuning of the feedback path. Notes Feedback path features 2nd order filter selectable LP, HP, BP, BS and all pass. Filter is tuned to midi event on channel 2 (using the loaded .TUN map). Comb filter lengths can be synchronized to the tempo. A few bug fixes. Make sure you right click on the main bar editor to access all the options such as setting the feedback filter type. Comments  After I finish up getting Anticode to v1, I'll spend some time updating Macomate in a similar way and add some proper documentation. Or maybe I'll document the current version first? Anyway, I'll get there eventually. Sorry it's taking some time. Chaotic additive under redevelopment (when time permits). Notes "Speed" of particle simulation can be modulated by output level of synthesizer, "Freeze" allows preferential locking of particle movement to X or Y axis, patches are stored in XML file for future (???) compatibility, some bugs/denormals have been fixed. Comments  Pocas v0.9 is not preset-compatible with Pocas v0.41. Noticing that there are some banks out there for 0.41, I guess this might be an incompatibility worth addressing. A comb filter effect based on the core code from MutantKoto. I guess this might make it slightly similar to ConcreteFX's more fully specified Brush, but I haven't used that effect/synth so I really couldn't say. Notes Fixed fractional delay. Previously had same problems as MutantKoto. A feedback delay featuring 2 frequency-warped lattice filters in the feedback paths. Lattice filter coefficients are scanned from a bitmap that can be user definable or are extracted in real-time from the input signal. Only available as a Windows VST. "Fade" - fadeout on no input was not implemented; now is. Interface was largely as-is Cocoa. For better or worse, it's now visually much closer to the Windows version. Still Cocoa-based, though (no Carbon-only host support). Comments  this is great news. one of the few effects i really missed when i moved to mac. thanks very much! A plucked string synthesizer which uses two delay lines to model each of the string's two polarizations (horizontal and vertical). Cross coupling of the strings is implemented, and string velocities can also be saturated to give wind instrument-like timbres. A frequency-warped lattice filter can be added to the output stage or inserted into the coupling path between the first and second string polarizations. Only available as a Windows VSTi. Notes Fixed fractional delay (timbre was previously dark for high registers, sometimes unstable for high "cutoff"). Comments  A great instrument indeed! But will it be updated? The newest version sounds too silent. 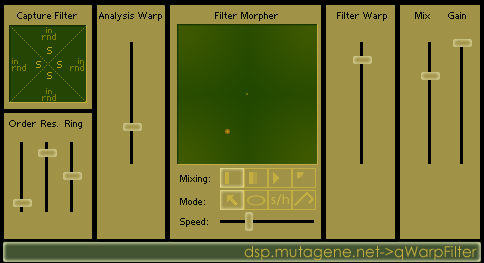 This plugin allows the user to perform a warped LP analysis of the input signal for each of four independent filter banks, whereafter the user can warp between all four filters using the XY touchpad control or use the 'filter warp' slider to change the warping in the filtering stage. The results tend towards bellish sounds or weird sleeping sounds reminiscent of the EMU Morpheus' filters. Only available as a Windows VST. Notes Recompiled with hand-coded assembly written for 2WarpDelay, but original files were corrupted and had to partially rewrite. Sound is slightly different, but overall a very similar effect. Biggest difference from previous version is probably the implementation of chunk saving and loading, which means that filters are now saved with patches and banks. A big improvement, I think. A screenshot can be found here (GUI redone so it's no longer an obvious Waves ripoff). Comments  Port to Mac please! Hope to see it in the near future. 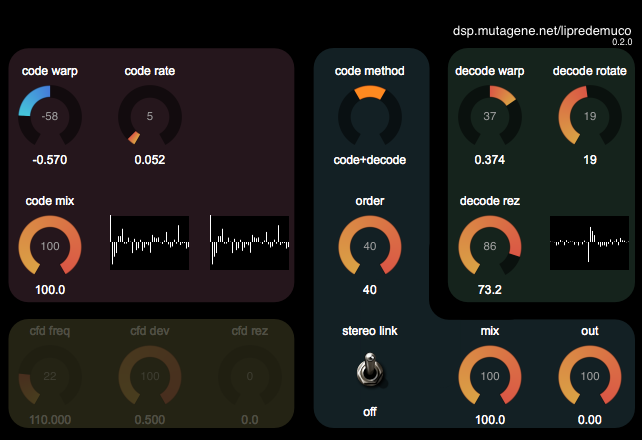 Simulates warped linear prediction coding of a signal, with some parameters added to further degrade and mangle the sound. Based on Aki Harma's research of warped linear prediction and warped filter designs. Only available as a Windows VST. Notes Think I fixed the bug that was causing problems with FL Studio (and probably Buzz too, though I haven't tested Buzz). It works on my demo version of FL Studio, anyway, though with short latencies it can get really trashy sounding. 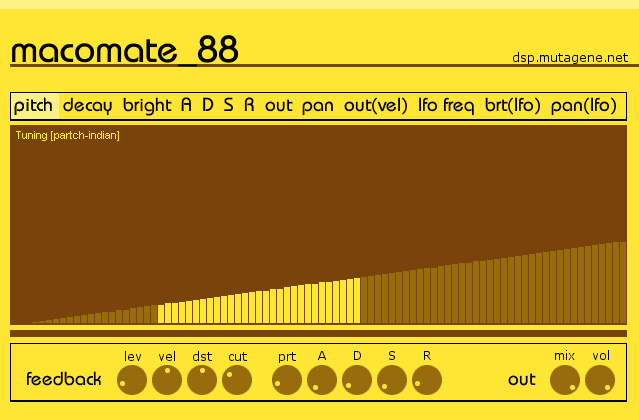 Try it on guitar sounds after a VST amp simulator for endless tone variations ! Also very good on snares - can change the tone/character of a snare. Sometimes it even seems to change the perceived decay time.